On some occasions, my wife or friends have something going on the night of a good concert in town. There is also a good chance they either don't want to go because its the middle of the week or the show is a couple hours away. I have to respect that because its a lot to ask a person to stay out until midnight on a Tuesday and drive home 2 hours after the show for a band you might not be that into. So, I am often stuck going to the show by myself. Now that I'm 30, its a bit harder to not seem like a complete weirdo hanging out at a venue solo. I find myself older than most of the crowd and even the band sometimes. I try to forget that and enjoy myself because I'm there for the music. However, I still want to feel comfortable and the only way to do that is blend in and not draw attention to yourself. I created sort of game plan for this such occurrence and follow a few simple guidelines to get me through the night. If you find yourself in a similar scenario, follow these tips to help you get through the night as well. I find this helps blend you in a bit and let others know you're there to enjoy yourself. If you have a beer in your hand, you're more likely to look like you're waiting for someone who might be in the restroom or getting a beer himself. I usually get a beer as soon as get there and nurse it a bit. There are some great places in Cleveland like the Beachland Ballroom and Grog Shop that have great beers on tap, so that helps you enjoy the beer as well. When you stand in the same spot for the whole concert the same people can focus on you for the whole show. This makes me feel a bit uncomfortable, so I try to move around a bit. Once you move, people are less likely to look to see what you're doing because they might not have seen you for most of the show. If you have a great spot and its at intermission or before the show starts, I'd suggest sparking up limited conversation with someone cool by you. Maybe about other shows coming up or that you've gone to recently. It helps pass the time and it could be interesting conversation. I have problem with this one. Especially now since I have updating this blog with concert reviews and I like to post a few pictures and video of the show. This just calls a ton of attention to yourself and makes you look like a tool. If you're fine with looking like a tool and taking two dozen pictures, then you're good. I look like a major tool at concerts because of this. If you're carrying around the t-shirt, poster and vinyl you just bought for an hour and a half, you're going to look like a nerd. I have a problem with this one too because I'm super into gig posters and I fear that they'll sell out if I don't buy one early. I usually grab the poster when I get there and then get a t-shirt as I'm leaving. The only guys that wear ear plugs should be dudes in the band or security. Everyone else should deal with the pain if you're in front of one of the speakers. Especially if you're by yourself. If you're wearing earplugs, you might as well be wearing a fanny pack. I always try to catch an opening act. I like to see new bands and catching an opener is a great way. However, if you're hanging around before the show or during intermission and you're by yourself, you're likely to standout. Try to show up right before the headliner if you need to. Rule Number 7: Stop caring whether or not people think you're a weirdo and just enjoy the music. Get a beer whenever you feel like it. If you are in a spot that works for you, stay there. If a t-shirt that you like is available in your size when you walk in, buy it and loop it around your belt. 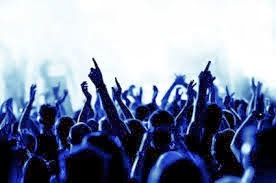 If you need ear plugs to cut the decibel level from 130 to 100, then go for it-- wouldn't you rather enjoy concerts the rest of your life instead of losing your hearing at an early age? And if you're a true music fan, then never skip the opening act-- that's how you discover new bands and expand your horizons!